The Melbourne Cup season is upon us again. A long planned trip South had to be cancelled at the last minute although by the looks of that unpredictable Melbourne weather perhaps Whispers is fortunate. Our Victorian racing spy disguised as a $2 poncho raincoat promises to keep his/her eyes open for fascinating snippets which usually means people you saw last week at a party in Sydney doing something else in Melbourne but probably dressed up to the nines. 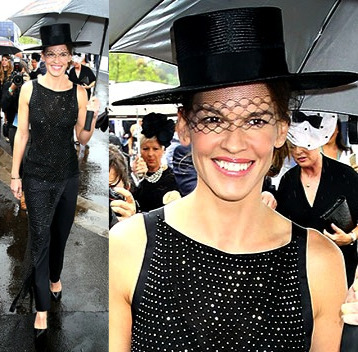 As always Swisse trotted out a major celeb- Hilary Swank this year, to pose in front of the dreaded "wall". It's a long way to come to stand in front of a wall but I suppose they are suitably rewarded (financially). As for Swisse, there must be big bikkies in vitamins as their rival Blackmores just demonstrated with a share price having risen from $31 to over $200 in a year and that's without a Hilary Swank standing in front of a wall. The entire world is awaiting (well the paparazzi are!) Will they or won't they? As a "close family friend of the Murdochs" promised : said: "It's all very new. They are really enjoying each other's company very much. "He is very fond of her. There is no question that they are a couple." Tonight is the final in the Rugby World Cup final at Twickenham and as the "close family friend" promised the star crossed lovers Rupert Murdoch and Jerry Hall are to appear in public for the first time together at the match as Australia plays New Zealand. We wait with baited breath.
" 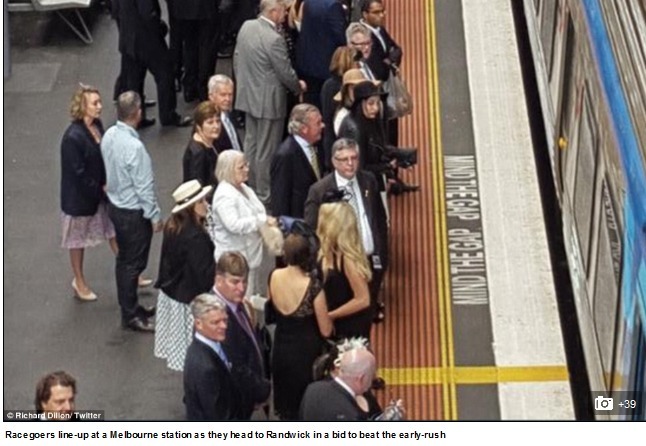 Racegoers line-up at a Melbourne station as they head to Randwick in a bid to beat the early-rush ". 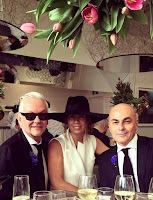 Melbourne to Randwick by train? About 900 kms and 12-14 hours.